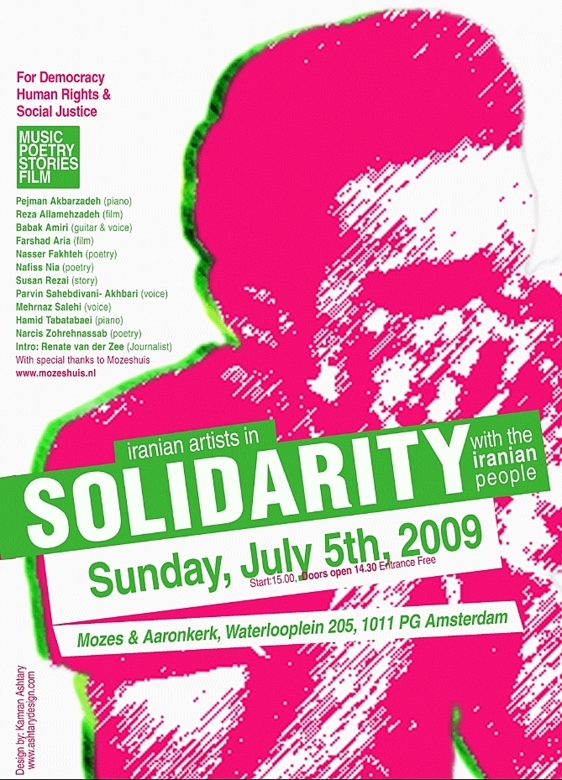 (Payvand.com) - Persian artists in the Netherlands will present poems, music, stories, and film in Amsterdam to show their solidarity with those in Iran. Participating in this event are: Pejman Akbarzadeh (piano), Reza Allamehzadeh (film), Babak Amiri (guitar & voice), Farshad Aria (film), Nasser Fakhteh (poetry), Nafiss Nia (poetry), Susan Rezai (story), Parvin Sahebdivani- Akhbari (voice), Mehrnaz Salehi (voice), Hamid Tabatabaei (piano) & Narcis Zohrehnassab (poetry). The event will be held at Mozes & Aaronkerk on Sunday, July 5th, 2009, at 15:00 with an introduction by the Dutch journalist Renate van der Zee. In answer to recent demonstrations in Iran that turned bloody due to crackdown by security forces, except for gatherings in Amsterdam and Delft, Holland's Persian community organized two demonstrations in front of the Islamic Republic Embassy and Dutch Parliament in The Hague.